Today I’m turning my post over to 384th Bomb Group veteran, Eugene Spearman. Eugene was assigned to the 384th Bomb Group, 544th Bomb Squad on AAF Station 106 Special Orders #26 dated February 2, 1945 as the Radio Operator/Gunner of the Edwin G. Nicolai, Jr. crew. He attended radio school in Sioux Falls, South Dakota; gunnery school in Yuma, Arizona; and crew training in Avon Park, Florida before he was shipped overseas. Eugene served thirty-four missions with the 384th from February 15, 1945 to April 19, 1945. He has written many stories about flying and about the 384th’s base in Grafton Underwood, and shared them with me. He agreed to my request to share them here with you and I think that you will enjoy them as much as I have. 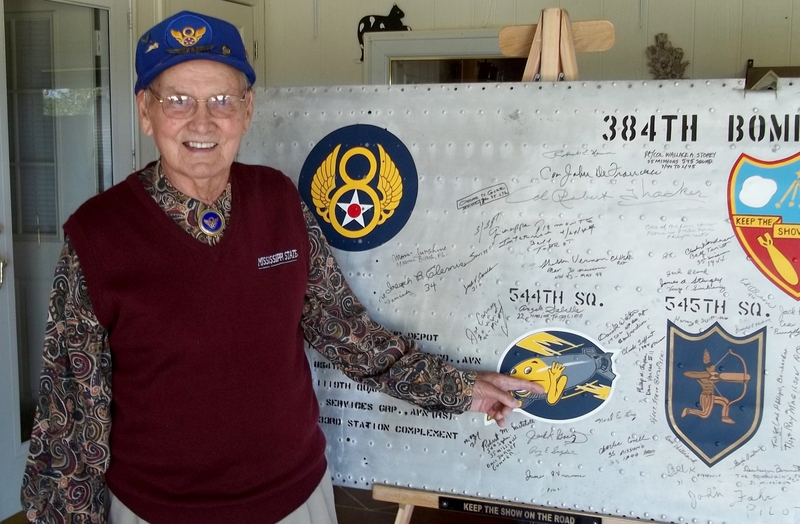 Eugene’s stories give me a greater insight to what life was like for the men in the 384th Bomb Group during WWII. I would hurriedly dress, ride the little English bike down to the mess hall that we called “Tomaine Tavern,” eat breakfast and then rush over to briefing. At briefing we were told the target for the day. If it was a location like Berlin, Hamburg, Leipsig, “a rough mission,” you would hear a “moan” from the group of crewmen. After briefing we put on our flying suits, picked up our parachutes and other equipment, and loaded on trucks that would take us out to the dispersed planes which were loaded with fuel and bombs. We then taxied out to the end of the runway and awaited our instruction to take off. Standing at the end of the runway was a minister, “Bro Billie,” holding a Bible and praying for us as we roared down the runway and became airborne. I am aware that very few people know what part the Eighth Air Force played in the defeat of Germany in World War II. The Eighth was the first armed force unit to attack Germany. They began these continuous attacks almost two years before D-Day. During these times, they destroyed factories, oil refineries, air fields and rail yards. On these very dangerous missions, over 26,000 airmen were killed in action, and well over 20,000 became prisoners of war with untold thousands wounded. Too, there were over 6,000 planes lost in this deadly struggle. Even on missions where 50 or more planes were lost, the Eighth never turned back. They never retreated. The average mission was about 10 hours long. We dressed in heavy wool suits and wore oxygen masks, flack suits and a heated-suit at an elevation of nearly 5 miles high and a temperature of down to 50 degrees below. When I was flying in 1944 and 1945, we were required to fly 35 missions before we completed our tour and were allowed to return to the USA. Our crew consisted of nine members. Two of the crew were KIA and three others were slightly wounded. My pilot, Ed Nicolai and I, Eugene Spearman, flew back to the USA in May 1945, having completed our tour. The name “Tomaine Tavern” comes from an early reference to ptomaine poisoning, which at the time was believed to be food poisoning caused by bacteria. Photo provided courtesy of the 384th Bomb Group. See this and more photos from the 384th here. Learn more about Eugene Spearman’s missions with the 384th here. By thearrowheadclub in 384th Bomb Group on February 24, 2016 .